Scientists say they have found a more accurate way to measure time. We currently use atomic clocks to count the seconds, but tests on an alternative atomic timekeeper have revealed that it is more precise. The devices, called optical lattice clocks, lost just one second every 300 million years - making them three times as accurate as current atomic clocks. Writing in Nature Communications, the team said they offered a better system for defining the second. We once used the Earth's rotation to measure time, where one spin equates to a day. Our current systems, called caesium fountains, expose clouds of caesium atoms to microwaves to get them to oscillate. But the new ones use light to excite strontium atoms. "For instance, if you have your wristwatch, and one day you are one second late, and one day one second early, then your clock is not stable. But it could still have good accuracy if over a million days the time is correct," Dr Lodewyck explained. Another clock is also undergoing development - an ion clock. 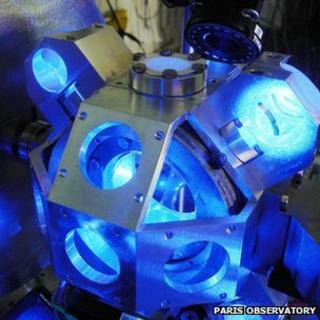 This clock loses just one second every few billion years, but because it relies on a single ion, it is not yet deemed to be stable enough for widespread use.